Location: .8 miles northwest of Elm Point, Great Neck. Description: 46 feet, red brick tower, structure is Second Empire Victorian style, fixed green light. Original optic was a Fifth Order Fresnel lens showing a fixed red light. Lens was later (1930s?) changed to a Fourth Order lens with fixed green light. 1866: Congress appropriated $6600 for a lighthouse on Hart Island. 1871: Hart Island was surveyed. 1874: Difficulties in obtaining the needed land on Hart Island force the Lighthouse Board to change the site to Stepping Stones. 1877, January 3: Findlay Fraser is appointed as first keeper. 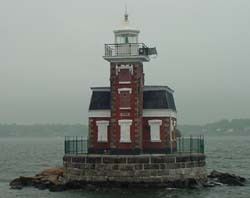 The surrounding area: This light, the westernmost on the north shore of Long Island, is visible from the Throgs Neck Bridge. Other information: The rocks breaking the surface in the area were known during colonial times as the Devil's Stepping Stones. Prior to the establishment of this light a buoy marked the Stepping Stones.